Finally back to painting. Oct. 1st I became a student at the Hein Academy of Art, where I will finally get some formal art training, something I've always wanted to do. It looks like it's going to be a great experience. Jeff Hein (you can look him up on the internet) is a very fine young Utah artist whose work is contemporary realism. I expect to become better at drawing and to refine my painting skills, without fundamentally changing my style. In the meantime, I am painting three or four mornings a week to keep my hand fresh, while my afternoons at the academy focus primarily on drawing at the moment. Here is my solution as to how to display this multi-panel painting. 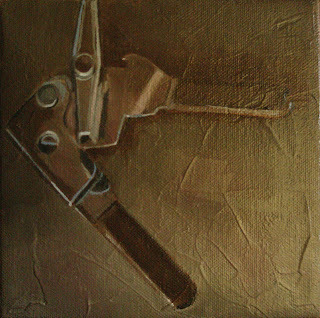 It was accepted into the Utah Arts Council tri-annual show, "Utah '08: Painting & Sculpture". The panels are mounted on a wood grid, made by me. 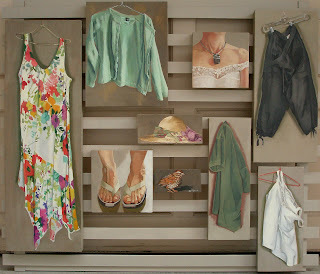 When you use a non-conventional format like a multi-panel painting, you have to be creative as to how to display it. It's asking a lot of the organizers of a show to place nails in the wall in just the right configuration to satisfy your design! Best to do it for them.